Casey's Space: What does it take to be a teacher? This year I celebrated my birthday in the Upper 6 classroom. Their warm thoughts melted not only my heart but also the Haagen Daz cake they ordered! Melted cake or not, I was deeply touched by their intentions. They took the trouble to arrange for someone to bring the cake just after my lesson which was their recess. It is during moments like this that you are reminded that the students can feel your love for them. 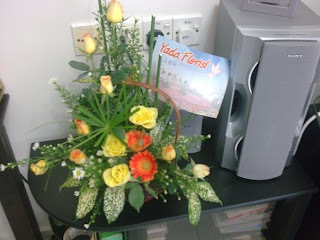 Just after their graduation ceremony this year, a Form 5 student brought a bouquet of flowers for me. I totally didn't expect it, so I asked him whether it was one of the bouquets used in the competition the previous day and used for decorating the hall. But he told me it was specially ordered from a florist. Silly me. The tag on the bouquet clearly shows its from a florist. 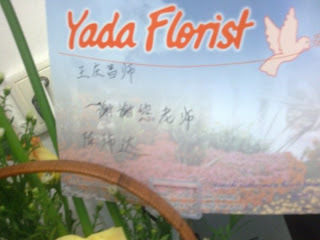 I was really touched as I noticed his form teacher and other subject teachers sitting near me didn't receive any flowers from him. Last year I celebrated my birthday with more than a hundred of students. On the birthday cake, they wrote" Happy Birthday Daddy". These are my St John Ambulance members. Another St John teacher adviser, Madam SK like to comment that I am like their father. Another teacher Madam BWW also commented that she can sense my relationship with the students is closer than teacher and students..its like father and children. Maybe its my grey hair! But more likely is that they can sense that I mean well. What does it take to be a loved teacher? Well, first you have to love children..especially the students. Sometimes they disappoint you, sometimes they make you angry. Sometimes you have to scold them, sometimes you have to punish them. But we always remember they are our "children". Some teachers bond very well with the students but some do not. But it doesn't mean they don't care. Each and every teacher is different in his own way. Just before the holidays started, one of the temporary teachers came over to say goodbye. She is a biotech graduate. I asked her what were her plans and she told me she will try to apply to train as a permanent teacher. Out of curiosity, I asked her the reason for doing so. She told me she didn't like the working atmosphere in the private sector..too competitive and too demanding. So I said the work of a teacher can also be demanding..it depends on how you take it. Here the HM's two eyes are not the only ones watching you. Hundreds of eyes are watching you. You can avoid the HM's scrutiny but ultimately the students are the best judges. They can sense the teachers' heart. So, again, what does it take to be a teacher? Basically you have to be academically qualified but on top of that you must have the passion for it. Just like other professions like doctors and nurses..you cannot just learn up to be a good teacher. If your mind is not into it, you can never be a good teacher. Besides these, do you know a teacher also needs to be multi-skilled (sports, co-curiculum, computer....) multi-talented ( a teacher is actually an actor in class sometimes) compassionate and disciplined. Once we take up the profession, there are certain things we cannot do in public anymore. And yes, one more thing...whether you are married or not...you have to take on a fatherly or motherly role because your anak murid sometimes look on you as their "parents".